Monterey Peninsula Unified School District uses California's Proposition 39 funding both to teach and to model sustainable practices in Nutrition Services and throughout the campus. School districts in the Center for Ecoliteracy’s California Thursdays® Network promote ecological education in many areas in addition to school food. 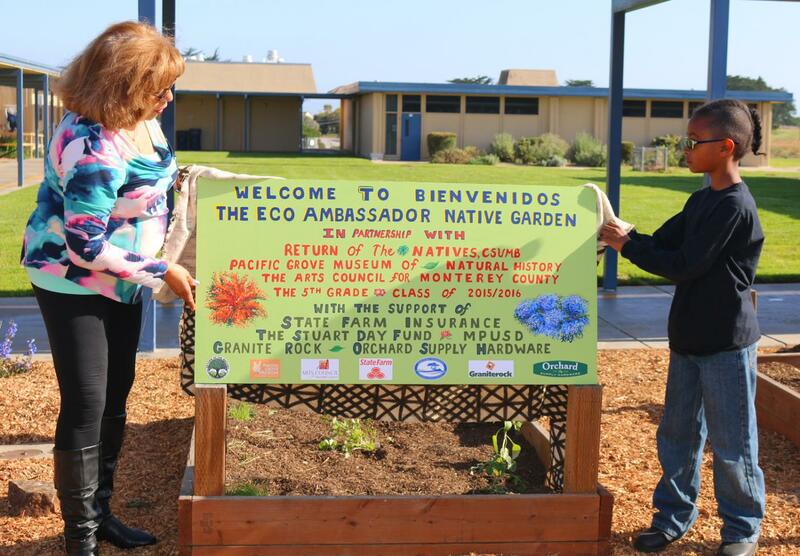 Take the experience of Monterey Peninsula Unified School District, which has built a sustainability strategy with assistance in part from Proposition 39, the California Clean Energy Jobs Act, approved by voters in 2012. David Chandler taught fifth-grade science in Monterey Peninsula for 13 years. He believed that the best way to teach about climate change was for students to interact with nature and engage in hands-on projects as much as possible. In order to target energy efficiency in the classroom, he applied for and received Bright Idea grants with Pacific Gas and Electric, the local utility, to conserve energy. As Chandler explains, the energy-reform pyramid has three levels. The lowest level is conservation. This involves changing habits, like turning off lights. The second rung is improving efficiency. And the top level is renewable energy such as solar and wind. He and his students started simply, by changing their habits. They turned off bright overhead lights and installed lamps with new CFLs (compact fluorescent light bulbs) on the tables, creating a calm, library-like setting. “Kids loved it,” Chandler says. “They got to be the stewards of energy conservation in the room.” The results of changing a few basic operating habits, like turning off computers not in use, surprised everyone. Chandler later moved from teaching into a full-time position as an energy specialist for MPUSD. In 2012, Proposition 39 passed, which meant that a portion of taxes collected from out-of-state corporations could be used to create clean energy jobs in California public schools. Upon receiving Proposition 39 funds, the district appointed Chandler as Coordinator of Renewable Energy and Conservation, with more responsibility and more financial support for maintenance crews to effect savings. Chandler’s philosophy of changing habits on multiple levels, from classrooms and cafeterias to landscaping, was applied across the district. IT implemented a district-wide computer-sleep policy. Thirsty lawns were renovated, replaced, or updated. Schools competed to see which could turn off the most items during holiday shutdowns. An energy audit conducted with Nutrition Services revealed high energy use from appliances, including refrigerators and freezers, which were often run at full capacity during the summer and other times such as winter break when classes were not in session. Nutrition Services staff consolidated storage into as few appliances as possible so that the others could be turned off. They also identified old, inefficient equipment that needed repair and replacement, and channeled energy savings into funds for preventative maintenance. The results were profound. From December 2012 to June 2016, MPUSD avoided more than $2.4 million in utility costs. The district is projecting over $1 million in avoided utility costs in 2016–17. According to Chandler, the biggest money saver has been through water conservation, to the tune of $600,000 a year. PK Diffenbaugh started as superintendent at Monterey Peninsula Unified in 2014, in the middle of what some researchers say is the worst drought to hit California in 1200 years. He affirms that water conversation has been critical. The district began to replace aged irrigation infrastructure. Every irrigated field area is controlled using weather-based smart irrigation controllers and maintained by a professional irrigation technician. These innovations have reduced water use by over 50 percent. Maintenance is implementing interior water conservation by replacing toilet/urinal valves, faucets, and aerators. A team from the district's maintenance department removed ornamental turf that required a lot of water and attention, and replaced it with drought-tolerant, educational native gardens and water conservation demonstration gardens. Nutrition Services is exploring instructional food gardens that can teach children where their food comes and about gardening that needs less water.